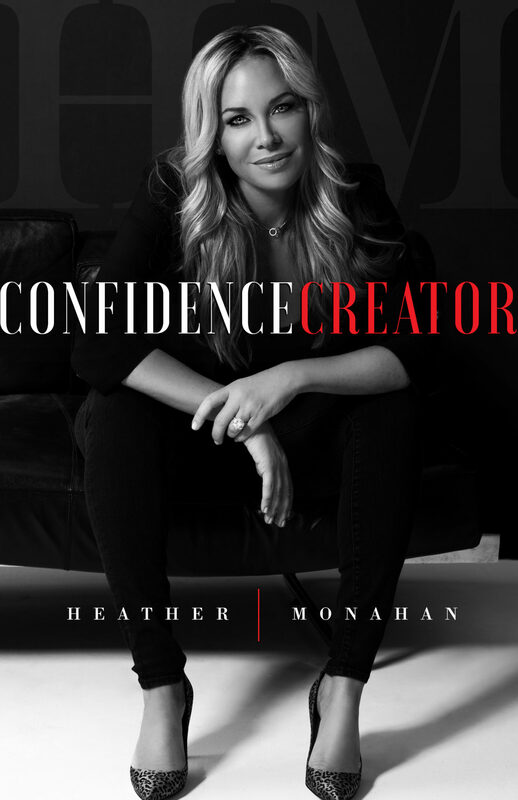 Heather Monahan is an author, a businesswoman, and a true #BossInHeels. Her new book ‘Confidence Creator’ has changed lives of hundreds of women, inspiring and empowering them. (Margarita): Please tell us about yourself and your new book. (Heather): Just like everyone else, I am someone who has struggled with confidence my entire life. Many people think that because the way I present myself or look from afar that I have had an easy life and am naturally confident. That is not the case. I am someone who has struggled since the beginning. My childhood in Worcester, Massachusetts was far from idyllic and I focused on making money to ensure that I would never be poor again. That drive took me from sales person to equity partner, ultimately creating 20 Million in value for my company in under 3 years. I then moved to Florida and began working for a publicly traded radio company where I pitched myself for a VP position that didn’t exist and was awarded it. After creating much value for the company, I pitched myself for and was awarded an Executive VP position and ultimately a Chief Revenue Officer title. During this time I married, gave birth to my son and divorced. My life took an unexpected turn when the CEO of the company became ill and his daughter took over. Having had enough of bullies and negative people in my career, I stood up to a woman that wanted me to stand down and dim my light. I made a conscious decision to shine my light and elevate myself. Ultimately, after 14 years, I was terminated. That series of events drove me to take the biggest professional risk of my career and go to work for myself. While I was petrified doing it, I wrote and self-published my best-selling book, Confidence Creator. I have learned through this experience that I am woman who owns her voice, shines her light so others can see and works daily to create my confidence. What made you write ‘Confidence Creator’? I got fired! After 14 years of advancement and reaching the C-suite in media, I unexpectedly was told my position was being eliminated and I could either sign a memo that said I was terminated or I could sign one that said I had decided to resign and pursue other things. That moment was pivotal for me, I said, “I didn’t write either one of these memos so I won’t be signing anything.” Then, I walked out. Being pushed out of that company after 14 years felt devastating to me in the moment but that experience is what drove me to write my book and start me down an entirely different path that has led me to the most rewarding and magical time of my life. How do you think this book is affecting the women who read it? It is mind blowing how the book has been affecting the women who read it. The responses I get from women truly overwhelm me! When I do book signings or events or receive DM’s on social media, typically I hear anything from, “you are speaking directly to me, how did you know this” or I hear, “after reading the book I decided to leave my job. I have been thinking about it for years but this made it clear to me.” Many women cry when they read the book and every woman feels empowered. Maria Menounos told me that she had always felt confident until she read the book and now she is working on owning her voice and standing up to bullies instead of walking away. It is so amazing to see how much we are all alike, so much more than anyone thinks. We all deal with the same struggles and a big one is doubting ourselves. Even when you can feel so confident in your relationship you may struggle with confidence at work. Or there are times where you are doing well at work and your confidence dips as a mother and you question yourself. Confidence is not a static thing and it is up to us to work on it daily to build it up and have a plan in place for when challenges arise. What is the next step for you? Are you planning on writing more books in the future? That is such a great question! The interesting thing about starting over at 43 years old and becoming a beginner as an entrepreneur and a writer is you have to create a path that didn’t previously exist. I am constantly meeting with different people and listening to ideas and opportunities and doing my best to decide what the next right move is. Sometimes I am right and sometimes I am wrong but taking those steps leads me to the next opportunity. I can tell you that since I put my book out on Amazon, I have focused on promoting it which entails speaking engagements, social promotion, book signings and events, appearances and collaborations. I am currently working on the outline for my next book, getting ready to launch my first video product, collaborating on merchandise concepts among many other things. The beautiful thing about going out on my own is that for the first time it feels as though the universe is rising up to meet me. The most amazing connections and opportunities are coming to me, unlike when I was in corporate America. When I was in my old job it felt as though things were tough and it was a constant struggle. Now, it feels as though things are flowing and working out so much better than I ever could have imagined without that grind. What was the most difficult part for you in writing ‘Confidence Creator’? The most difficult part for me was sharing my lowest moments with the world and knowing the haters were going to come. That feeling of being terrified about putting it out into the world and that feeling of potential failure and not knowing if it was going to work was debilitating. Because I wasn’t an “author” I had always been a “business executive” I questioned myself daily and really struggled with my confidence so much during this experience. There were so many people that told me not to do it and there were so many times I nearly backed out. It really was all about fear and self-doubt and that is finally how I figured out I HAD to do it. I have come to realize that when I am most afraid the only way for me to build confidence is to move through the fear and take the chance, so I can see what is on the other side. Every time I do that, I win! What in your opinion is the most important lesson one should learn from it? That in any moment you can build your confidence or chip away at it. Creating confidence is a choice. My son Dylan. My son has taught me so much about building confidence, taking risks, and being fully open to love. He is eleven years old but wise beyond his years. What advice would you give to young people trying to find themselves and their purpose in life? Don’t follow the paycheck, if you do, you will end up looking for other work in the future. Identify your superpower and spend time there. Everyone has something special about them, figuring out what it is that brings you joy and spending time in that space will help you to reach your fullest potential. Some people find that when they are drawing time gets away from them because they love it so much or others may enjoy editing written material and have a real gift for improving other’s thoughts and words. Working to figure out what your superpower is will truly allow you to find your passion in life and step into your power. Just because you are good at one thing doesn’t mean that is your superpower. It is so important to find what brings you joy and what you feel joyful doing. Once you find this, you pursue it as if your life depends on it because in some ways it really kind of does. Journaling has been one way that I have been able to identify my superpowers. By reading over past journals I can see when I am at my best and feeling powerful in those moments I am typically talking about me speaking or on a stage at an event. However this was not my job at the time, I had to go through journals to begin piecing together what I thought it could be. Another way to identify your superpower is to ask those in your network what they think it is. When you do this you naturally build confidence because you get to see yourself through the eyes of those that care about you and see you as special and unique. Another way I have identified my superpower was getting out of my comfort zone and doing something that I had never done. I took a standup comedy class and I only took it because I really didn’t want to and that led me to believe that I should take it and wow was I right. Taking that class and putting myself in that strange environment opened my eyes to what was different about me. When we see ourselves in front of the same people each day in the same environments it isn’t as obvious to ourselves or others what may be so special about us, moving outside of that comfort zone can shine a light on your talents quickly.